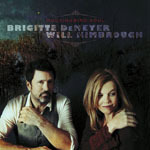 Share the post "Album review: BRIGITTE DEMEYER & WILL KIMBROUGH – Mockingbird Soul"
Brigitte DeMeyer’s last ‘less is more’ Americana release – Savannah Road (2014) – an album that transported you deep into the southern heartlands to a balmy ramshackle porch, a rocking chair and the sound of the swamps calling – was enough to have me searching her back catalogue. And I wasn’t disappointed. Her latest offering finds Will Kimbrough (acoustic guitars, banjo, harmonica on her last two albums) elevated to co-writer and singer. Chris Donohue, who’s played on her last three albums continues to play upright bass, and in contrast to previous releases which have featured keys, drums, percussion and electric guitars, the cast list on Mockingbird Soul pretty much ends there. So while the main ingredients of previous releases remain, Mockingbird Soul is a more stripped back effort, focusing on songs delivered with a sparse acoustic delivery. Kimbrough’s prominence also alters the dynamics with harmony vocals a prominent feature, and lead vocals shared. So while there’s a clear chemistry as the duo plough Southern blues infused fields, Mockingbird Soul is a measured distance from DeMeyer’s ‘solo’ work. As always, her vocals are exemplary, the harmonising works well, and there’s some impeccable playing. This entry was posted in ALBUM REVIEWS, ALBUM REVIEWS (Mobile), All Posts and tagged acoustic, album, Americana, Brigitte DeMeyer, country, folk, Mockingbird Soul, review, singer, songwriter, Will Kimbrough. Bookmark the permalink.